Home » World News » Russia has proof to show Turkey is buying oil from IS; Will Erdogan now resign? On 2 December, Russia produced what they claim is evidence of an illegal oil trade between Turkish President Recep Tayyip Erdogan and terror outfit Islamic State. 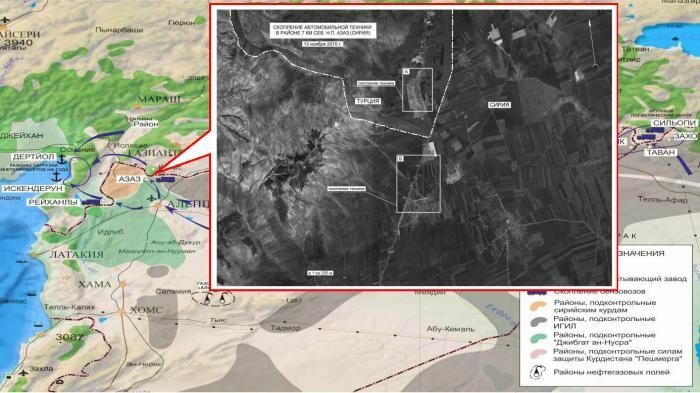 In a media briefing in Moscow on Wednesday, the Russian Defence Ministry announced that they had uncovered three main oil smuggling routes to Turkey. According to a Russian Times report, Deputy Defense Minister Anatoly Antonov alleged that Erdogan and his family were involved in buying the smuggled oil from Iraq and Syria - the main source of income for the Islamic State. Is Turkey buying oil from IS? "A whole team of bandits and Turkish elites stealing oil from their neighbours is operating in the region," the defense minister claimed. He alleged that oil "in large quantities" enters Turkey via "live oil pipelines". The Islamic State is funded almost entirely by smuggling of oil and petroleum products, and now Russia is confident that Turkish President Recep Tayyip Erdogan is involved. RT quotes Lieutenant-General Sergey Rudskoy as saying that the income from oil smuggling had been halved ever since Russia began their air strikes. The Defence Ministry of the Russian Federation has published photos of trucks and maps highlighting the movement of the oil on their website. Hasn't Putin being saying this for a while? Russia has been making claims about Turkey's involvement in the Islamic State's oil smuggling business for a while now. A Russian military aircraft, a Russian Su-24, was downed on 24 November, and President Vladmir Putin had alleged that the aircraft was shot down in order to protect the oil supply lines from IS to Turkey. Erdogan had claimed that he would resign should Russia prove its allegations of an illegal oil trade. News reports, including this article by the Guardian, claim that "there is considerable evidence that his (Erdogan's) government has been at least tacitly aiding IS itself". The BBC confirms that smuggling of oil from Syria to Turkey has been going on for decades now. "It is highly likely that Turkish business people, customs officials and intelligence agents are among the people implicated, but the scale of the entire trade is tiny compared with Turkey's own energy economy (in which Russia plays a dominant role), and most of the participants are within Syria," the BBC reported. Turkey has consistently denied the allegations. "We are not dishonest so as to do this kind of exchange with terrorist groups. Everyone needs to know this," the AFP quoted Erdogan as saying. According to a BBC report, a large chunk of Turkey's oil imports come from Russia. "In 2014 Russia also supplied 27bn cubic metres of natural gas to Turkey, representing 56 per cent of its total consumption," the BBC says. At the sidelines of the UN Climate Conference in Paris on 1 December, Putin and Erdogan made swipes at each other in separate media interactions. Putin: At the moment we have received additional information confirming that that oil from the deposits controlled by Islamic State militants enters Turkish territory on an industrial scale. The downing of the Russian Su-24 only served to further sour the ties between the two nations. The day after the attack, RT reported that the free visa-regime for Turkish people going to Russia would be cancelled starting January 2016. A number of economic sanctions were also imposed against Turkey. On 1 December, US President Barack Obama urged Turkey and Russia to put their differences behind and focus on decimating the Islamic State. But with these latest revelations, it looks like a reconciliation is the last thing on the minds of either nation.